Constructed of a shatter resistant, high impact strength non BPA copolyester; the system comes complete with two purification elements, a base and utilizes the latest technological advances. This system has a storage capacity of about 2.75 gallons and when in use it stands 26.5 in height with a diameter of 9. The system stands 21 when used without the base (included). The Berkey Light� system is designed for use during travel, outdoor activities and during unexpected emergencies. 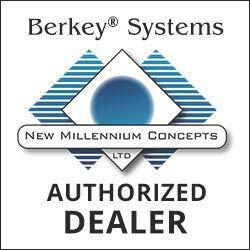 The Berkey Light� system sets up in minutes. 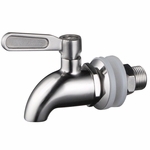 Simply screw in the purification elements and spigot, snap the chambers and base together and you are ready to filter your water. Black Berkey� Purification Elements are more powerful than any other gravity filter element currently available and fit most gravity filters, dramatically improving their ability to remove unwanted contaminants. Black Berkey� purification elements are so powerful, they can remove food coloring from water without removing the beneficial minerals your body needs. Virtually no other filtration element can duplicate this performance. We tested the Black Berkey� purification elements with more than 10,000 times the concentration of pathogens per liter than is required by standard test protocol. This concentration of pathogens is so great that the post filtered water should be expected to contain 100,000 or more pathogens per liter (99.99% reduction - the requirement for pathogenic removal). Incredibly the purification elements removed 100%. Absolutely no pathogens were cultured from the effluent or were able to be detected, even under an electron microscope, setting a new standard in water purification. Nitrates, Nitrites, Rust, Silt and Sediment.